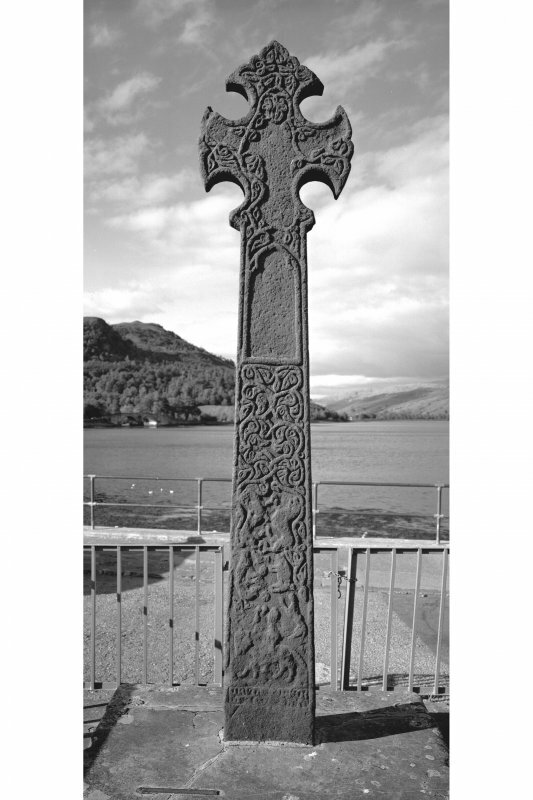 Cross at Inveraray, front, reverse and side faces. From J Stuart, The Sculptured Stones of Scotland, vol. ii, 1867, plate xxxi. Inveraray, Pier, Cross. View of North face of Cross. Uncertain whether plans relate to Inveraray Castle Cross or Inveraray, Pier, Cross. 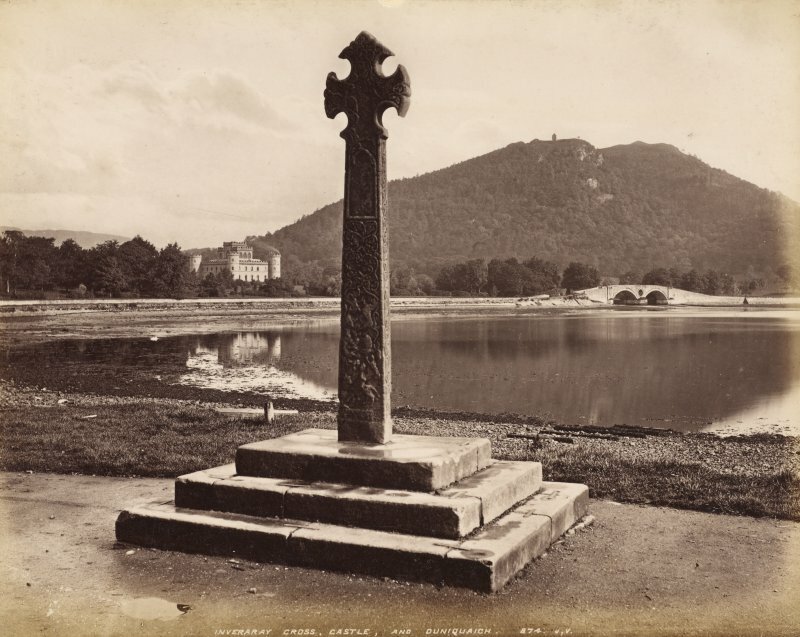 This 15th century cross standing on the sea front at the end of Inveraray Main Street formerly stood in the old town, which was nearer the Castle (See NN00NE 13). An old print shows the cross on its old site on an arcaded balcony as a typical Mercat Cross (Campbell and Sandeman 1964). Originally, it has probably come from some burial ground, as the commemorative inscription on the shaft reads: "Hec est crux nobilium virorum videlicet Dondcani meicgyllchomgan Patricii filii eius et Maelmore filii Patricii qui hanc crucem fiere faciebat." The crucifix has been defaced, and a figure of St Michael has been chiselled away from the back of the upper arm of the cross. J W Small 1900; J S Richardson 1929; M Campbell and M Sandeman 1964. The cross is as described and illustrated. Visited by OS (D W R) 7 March 1973.
c.1400. Monolith on stone base of 3 square steps. T.S. Muir 'Characteristics of Old Church Architecture'. 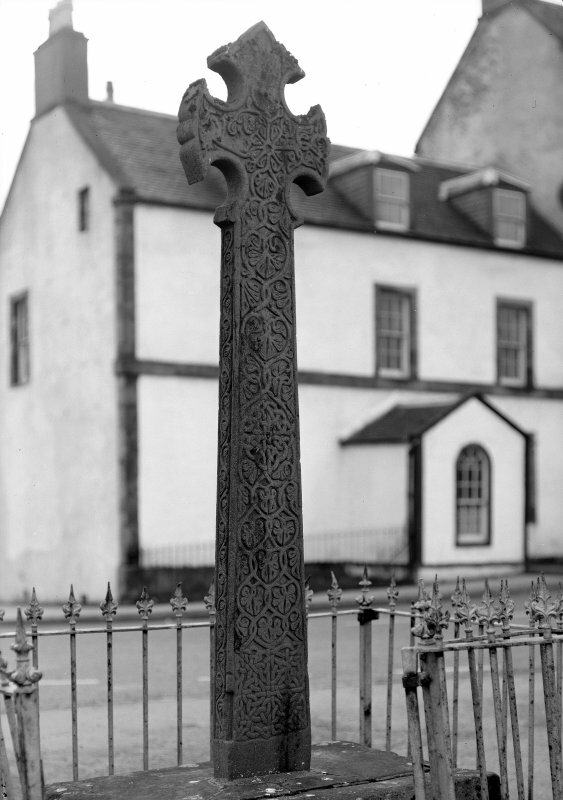 This fine late-medieval cross stands on a three-stepped pedestal on the NE side of Front Street, on the axis of Main Street and a few metres from the sea-wall of Loch Fyne. It may originally have stood at the medieval church of Kilmalieu (No. 65), but was subsequently erected as the market cross of Old Inveraray (No. 199) on an octagonal pilastered structure of 17th-century character, shown in Paul Sandby's drawing of 1746. It was presumably in this position when the inscription of 'Inverara Cross' was recorded by Lhuyd in 1699, and its base was dismantled about 1775.Following a period of neglect, it was re-erected on its present site in 1839 (en.1). 'This is the cross of noble men, namely, Duncanus MacCowan, Patricius, his son, and Mael-Moire, son of Patricius, who caused this cross to be made'. 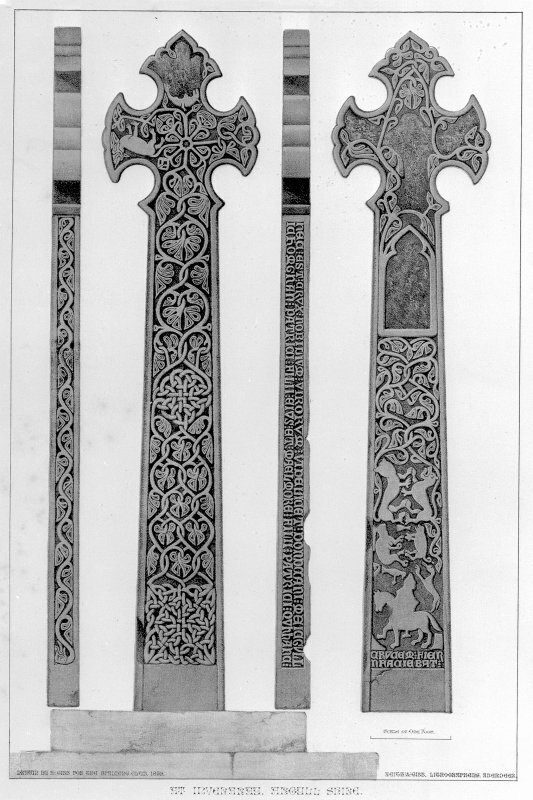 The front or SW face evidently contained in the cross-head a figure of the crucified Saviour which, as in the Campbeltown Cross, has been carefully cut away, the loss being concealed by the carving of additional stems in the surrounding foliage. At the top of the shaft is a cusped niche from which a figure, perhaps of a donor, has been similarly removed, followed by plant-scrolls and then a group of animals including a boar pursued by a hound, and at the foot a horseman with a hawk on his wrist, above the final lines of the inscription. On the back of the cross the top arm showed a figure of St Michael, which has been almost erased except for the dragon on which he stood. At the centre of the cross-head there is a foliated cross, incorporating in the left arm a fantastic quadruped, and linked in the shaft to elegant intertwined plant-stems interrupted by two squares of plaitwork. The cross is a product of the Iona school, and its close resemblance to the Campbeltown Cross of about 1380 indicates a date in the late 14th or early 15th century. Other members of the MacCowan family (Mac Gille-Chomgdin,'son of the servant of St Comgan') witnessed a Glassary charter of about 1350, and it has been suggested that the three generations recorded on the cross belonged to the succeeding period, so that the grandson Mael-Moire ('servant of theVirgin Mary') who erected the cross may have been active in the first half of the 15th century (en.4).